Маркирани оферти за Evercool DirectTouch 120mm PWM Как са подбрани? 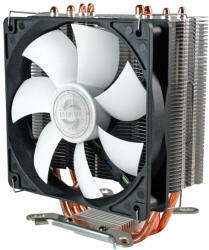 PWM fan to adjust the power of the fan efficiently, enable HPQ-12025 to obtain both cooling performance and quietness. H. D. T. (Heat-pipe direct touch) technology, efficiently diminish thermal resistance, enhancing heat conductivity. 4 x 6mm copper heat pipes soldered tightly with fin, to ensure fastest Thermal conductivity.